When Kim, the Founder of Rhode Island Creative Magazine asked me if I was interested in displaying a wearable piece of art in the August issue, I knew right away exactly what the perfect piece would be. Keeping in mind that it was summertime, I channeled my love for vintage flair and decided to use an old antique macrame clutch purse as my blank canvas. 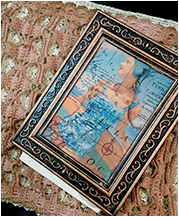 A fabric block with a bathing beauty and vintage map scene printed on it became my focus of sunshine. I quickly scanned through my inventory of shells, sea glass and driftwood I had acquired on precious days walking with my children along the Rhode Island seashore. I knew some day I would incorporate these memories into something that would become both handy and unique. I shifted gears quickly and found just the perfect crocheted doily, fabrics, twine, antique buttons and embellishments to add to the canvas--my wearable purse. I laid everything out, walked away, came back and shifted things around a bit...but I felt like something was missing. I needed the perfect touch to express my art. I thought about what I had saved from my children that I could add to my design. Then I found it: a pair of old jean overalls I saved from my son’s toddler years! I began ripping and tearing a small section to incorporate just a tad of sky blue to work with the graphic on the fabric block. I twisted and tied the denim into handmade flowers that fit perfectly on the masterpiece I had created. This purse will be a keepsake for me because it recaptures times that I value and appreciate in my life. A true breath of sunshine. 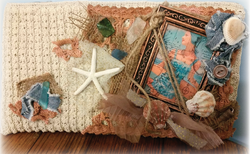 Now apply your Heirloom crochet doily and a fabric block with vintage beach beauty printed on it. Place the metal frame to add character and depth. Then start applying your twine, shells, ribbon, pieces of fabric to finish the look you have envisioned. Purchase a Vintage purse from a local Antique store. (Shop local!) Choose whichever style will work best for your design.